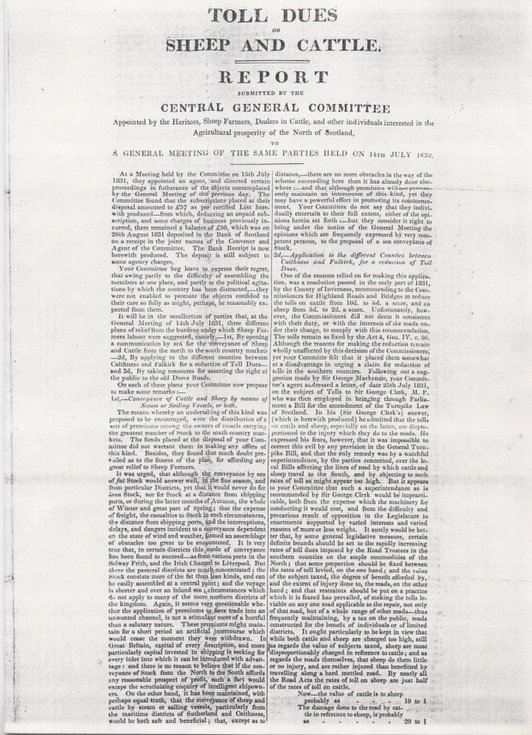 Photocopy of a printed report entitled Toll Dues on Sheep and Cattle, submitted by the Central General Committee to a meeting of the Heritors, Sheep Farmers, Dealers in Cattle and other individuals interested in the Agricultural prosperity of the North of Scotland, on 14 July 1832. The committee had been appointed to look at three ways of reducing the cost of getting livestock to market from the north: transporting animals by sea, getting a reduction on toll dues on the parliamentary roads, and asserting a right of use of old drove roads. The conclusion was that a combined effort should be made by Inverness, Ross-shire, Sutherland and Caithness to get a reduction on toll dues, get a general ruling on tolls for livestock based on the damage done to the roads and the benefit derived, and create a drove road to a plan by Thomas Telford. This copy of the report had been sent to D. Gilchrist Ospisdale. Two loose sheets back to back.